Matthew and Mary, Anna and Bates: Downton’s great couples. Decoding the four big kisses of this week’s episode. My own household of servants is currently being called upon to prevent me from engaging the caps lock key for the next few paragraphs. Perhaps they’ll permit me one “OMFG!” They sure shoehorned a lot of significant events of great import into two hours of television, eh? I can’t possibly discuss all that action, so let me focus on a few key kisses. First, Mary and Matthew’s very cinematic smackeroo, which Lavinia apparently got a load of. I guess we now know that Lady Mary’s black widow power is so strong she can even kill the fiancées of the men she ensnares. Once Lavinia dies, Matthew feels guilty, telling Lady Mary, “I believe she died of a broken heart because of that kiss—and we were the ones who killed her.” No, Matthew, it was the Spanish flu. I think he should’ve paid more attention to Lavinia’s declaration that Mary would be better at, and get more enjoyment out of, being the wife of the future earl of Grantham. Do you two believe that this really is the end for Mary and Matthew? Next, Lord Grantham and maid Jane’s furtive lip lock. Obviously those two have a profound connection and oodles in common. Oh, wait. Actually, Jane did rather well out of those few seconds in his lordship’s dressing room—sure, she’ll have to find a new job at a tough time (what with all those titled families giving up their homes), but Lord Grantham has set math whiz Freddie up for life. Why, if they ever make Downton Abbey: The Next Generation, I bet Freddie will be our entrée into the exciting world of Bletchley Park. And then there was Anna and Bates’ nuptial nuzzling. Is it just me, or was Mr. and Mrs. Bates’ bedroom scene kind of gross? I suspect that Brendan Coyle, who plays Bates, annoyed the cameraman, because the way he was shot did him no favors. Or maybe my distaste came from knowing how well other denizens of those fancy upstairs rooms—Mr. Pamuk, William, Lavinia—did in the end. 1) I hate to see his ambitions surrendered so easily, even though Thomas has always had a problem with follow-through. I know I should feel relieved that he was such a terrible petty criminal, but he didn’t fail because he’s too good-hearted; he failed because he’s a bad businessman. Can’t a working-class man catch a break on this show? 2) I understand that he was gleeful to win back his spot below stairs when the alternative was homelessness and penury, but I don’t get why everyone is saying he’s back for good and that Carson should feel threatened. OK, Thomas helped out at an extremely difficult time, but he’s still a known thief and generally not liked or trusted by people with power. Why is everyone acting like those character issues have gone away? 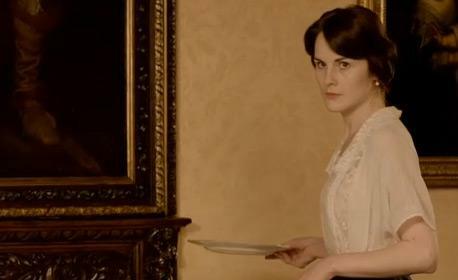 Editor’s note: For the benefit of American readers who haven’t yet seen Season 2 of Downton Abbey, please do your best to avoid spoilers for next week’s finale when commenting.